Our featured product this week is this funky ring featuring an acrylic chrysanthemum cabochon. 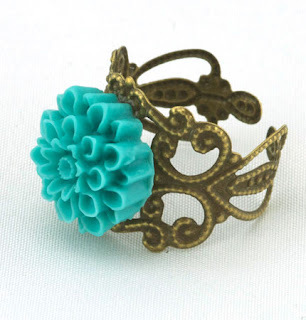 The flower is a gorgeous turquoise colour, which nicely complements the antiqued brass filigree ring. This eye-catching ring is very light and comfortable to wear and is flexible and easy to adjust. Click here for more details and to purchase.